Well this side of the kitchen is done! 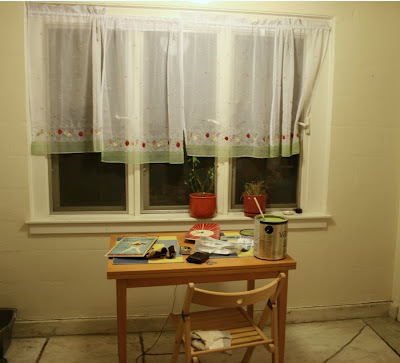 I painted the kitchen nook maybe 6 months ago then I abandoned it because my husband and I couldn't agree on a kitchen table set. Well, he was finally sick of looking at an empty kitchen so he let me get what ever I wanted. I hunted for a month and finally found this cute yellow and white 50's set. Oh I saw that set on your blog months ago and thought it was so cool. 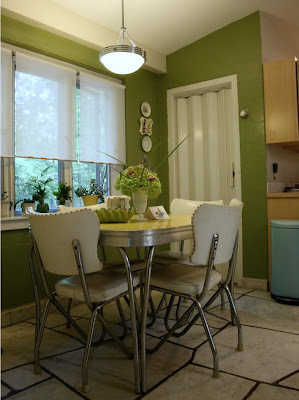 I really like the green wall color. 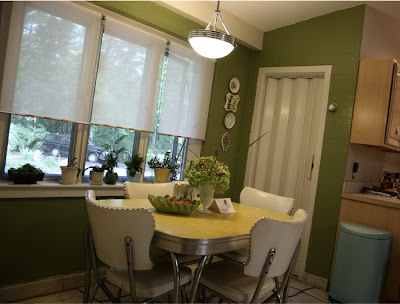 For a while that was the color I wanted in my kitchen. I got the paint at Lowes on a whim. A gallon of paint for only $3, it was a mistint. Beautiful!! Would love to do something like that with my kithen. Heck.. I'm having a tough time getting my bride to let me "retro-fit" my small home office.